Just when the classic Casey Stengel inquiry, "Can't anyone here play this game?" was about to receive a resounding "No!" from anyone bearing witness, a classic bit of defensive deftness rescued the Sox and preserved what became a 5-3, 7-6 sweep of the Brewers. With two on and one out in the eighth, Sox second baseman Dustin Pe droia grabbed Corey Hart's smash, whirled, and threw to second, where shortstop Alex Cora flashed across the bag and gunned out Hart at first to complete the inning-ending double play. "Hugest part of the game," manager Terry Francona said shortly after midnight. "It's hard to win two games." The most grateful recipient of that glove work was Sox reliever Javier Lopez, whose stumbling effort on Ryan Braun's tapper to the mound had resulted in the game's seventh error, a mistake he compounded by walking Prince Fielder. The Sox already had blown a 5-0 lead, Craig Hansen undone by Mike Lowell's throwing error and a tough error charged to Cora on a high chopper before giving up a two-run single to Craig Counsell that gave the Brewers a 6-5 lead in the seventh. But not to be outdone in generosity were the Brewers. Second baseman Rickie Weeks couldn't handle Jacoby Ellsbury's leadoff grounder in the bottom of the inning and was charged with an error. Pedroia followed with a ground ball to third baseman Bill Hall, who threw wildly to second base, both runners advancing a base. David Ortiz brought home the tying run with a grounder to short, and a bloop single by Kevin Youkilis into short right field scored Pedroia with what proved to be the winner. "It was one of those games where it seemed like it took forever and you've got to scratch and claw," Youkilis said. "By the end of the game you're dragging, your bat's dragging. Your body. "You have to try to will yourself through the end of it." The sweep eased the migraine-inducing problems caused by the short turnaround between games, which, because of TV obligations, could not start before 3:55 p.m. Somehow, within no more than 15 minutes, max, the stands were emptied of 37,409 people after the Sox' first win, and a small army of people picking up the trash won their battle to clean Fenway before 37,847 elbowed their way in to see the Sox win the second game. The doubleheader sweep, which improved the Sox' interleague record to 30-8 since the start of 2006, restored the Sox to a virtual first-place tie with Tampa Bay, a 9-8 loser to the Cardinals. Traffic? You don't want to know. But with Dave Mellor's grounds crew working double time to get the infield ready for the nocturnal nine-inning exercise, fans began streaming in at 8 and Tim Wakefield delivered the first pitch of the second game at 8:36 p.m. The Sox players did their part to facilitate the timetable, tidily dispatching of the Brewers in the first game to end a four-game losing streak. They did it behind Daisuke Matsuzaka, who created an international sensation just by showing up last season, but, with the spotlights turned way down, is now pitching like a guy worthy of all the fuss. Matsuzaka, with Senator Ted Kennedy watching from his hospital room, according to aides, ran his record to 7-0 to become the American League's second seven-game winner and the only one who is undefeated. Matsuzaka was backed by Ortiz's three-run home run. "More so than any pitcher I've ever faced, he'll throw any pitch in any count," said Braun, who had two of Milwaukee's seven hits off Matsuzaka in 6 2/3 innings. "He's one of those guys that will never give in. When you do get a pitch you need to take advantage of it because he doesn't make too many mistakes." The Japanese righthander also lowered his earned run average to 2.15, which placed him third in the league in the category, by limiting the Brewers to two unearned runs, coming in the seventh on a home run by Mike Cameron after the rarest of Sox miscues, an error by Youkilis. Not to worry: Youkilis's record errorless streak at his primary position, first base, remains intact - 222 games and counting after Game 2. His error yesterday afternoon came at third base, where he had started ahead of Lowell, who split doubleheader duty with Sean Casey. Lowell drove in four runs in the second game with a two-run double in the first and two-run home run in the third, his fifth home run in 11 games. 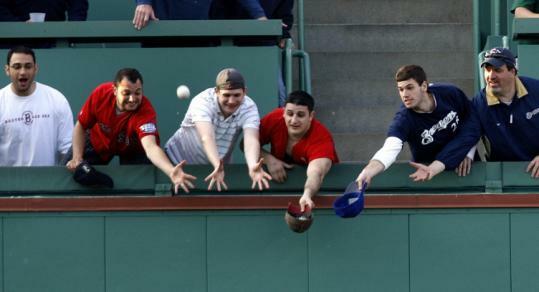 Youkilis's error might have been called a hit by a more charitable scorer. He gloved a hot smash by Weeks with two out and nobody on in the seventh, but the ball popped out of his glove, just long enough for the swift Weeks to beat Youkilis's throw across the diamond. Cameron followed with a first-pitch home run off Matsuzaka over the Monster and the Brewers had halved the Sox' lead, Boston having scored four times in the first two innings off Jeff Suppan. When Braun followed Cameron's home run with a line single, Francona elected to bring in Lopez to face Fielder, the Brewers' slugger having already bashed two doubles off Matsuzaka. Lopez, pitching in a situation ordinarily reserved for Hideki Okajima, who has complained of a sore wrist, walked Fielder and yielded to Manny Delcarmen, who is slowly working his way back into Francona's good graces. Delcarmen induced Hart to hit into an inning-ending force play, then worked a scoreless eighth before giving way to Jonathan Papelbon. By then, the Sox had added another run on doubles by Jason Varitek and Ellsbury, and thus were better positioned to withstand Braun's solo home run off Papelbon with two outs in the ninth.